A results URL allows you to send the results of a campaign to another member of your company, who may not have a Gator Account. You can restrict what they see and set a password to make it secure. 1. Once in the results screen, click the "Results URL" button along the top. A window will then pop up with data options you wish to give to the person who is receiving the URL. Once completed, set a secure password you can give to your colleague so they can access the URL. Please Note: 'Live Feed' will not be shown if 'Show Sensitive Data' is not checked. 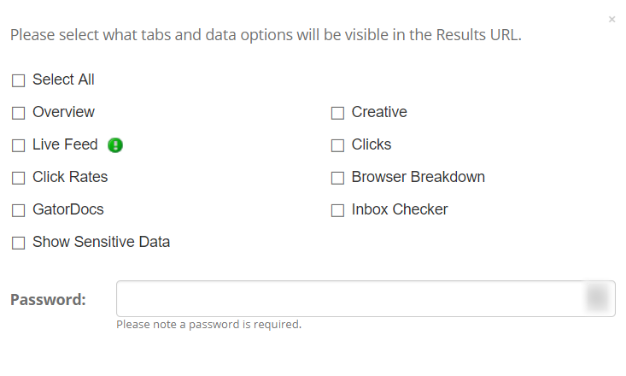 The Results URL will appear as shown above with the URL varying. When they enter the URL it should appear as above on their screen. They need to enter the password that was set to gain access.